The Dallas Cowboys are more than Dak Prescott, Dez Bryant, and Ezekiel Elliott this season. There’s a side of the ball that has been quietly shutting down opposing offenses, and the Arizona Cardinals experienced the worst of it on Monday night. On Sunday, the Los Angeles Rams will be facing another NFC East opponent with another impressive front-seven, one that has 11 sacks in three games. 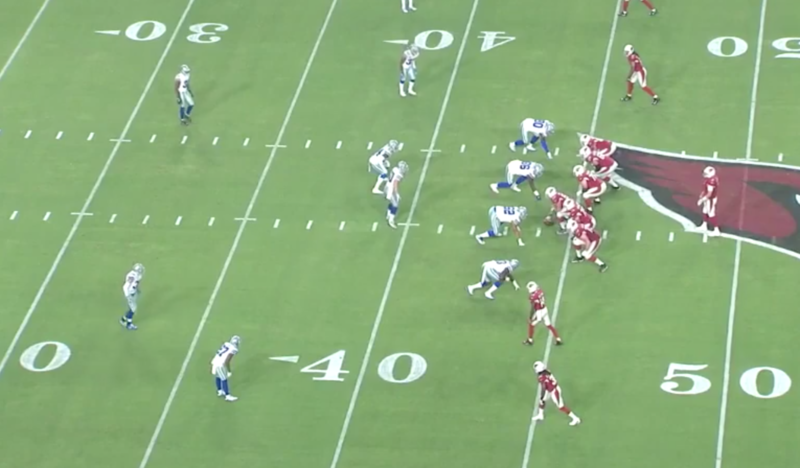 Of those 11, more than half belong to just one facet of the defensive front: DeMarcus Lawrence. The Rams offensive line better come prepared, and QB Jared Goff better be on his toes, because it’s going to be a long day in Dallas. DE DeMarcus Lawrence wasn’t a nationally well-known name until Monday night’s dominating 3-sack performance. Since 2014, Lawrence has racked up 16 sacks, and seven of them were recorded in the first month of the season. Before the Arizona game, Lawrence was averaging two sacks-a-game. He will likely meet or exceed the number of sacks he recored last week, as RT Robert Havenstein is simply not good. On his best day, Havenstein is average, and Sunday will not be his best day, as Lawrence has been consistently getting off the line-of-scrimmage with power, speed, and a relentless engine. Lawrence is a big guy who knows how to use his hands. He spars with right tackles and wins often. He has 26 pressures this season, and had 13 alone on Monday night. While he doesn’t secure the tackle on the play, he comes pretty damn close. But that’s besides the point. Watch Lawrence move his big frame. He whips his body around the tackle. The Cardinals executed a draw run, but Lawrence almost blows it up for a huge loss. Again, Lawrence narrowly completes a huge loss only for the Cardinals to slip away. But the physical talent of Lawrence is very impressive, and it will be the cause of the Rams’ second-year quarterback demise should Havenstein be unable to put his best game together. The Rams cannot rest on guard help in this game. There is not help. It’s Havenstein on an island. Putting a tight end next to the tackle didn’t seem to work all that much Monday night. On this play, Lawrence takes advantage of the tight end, who gets no help from the right tackle. DT Aaron Donald is a physical freak, but not even he can do everything on his own (although not for lack of trying). The same goes for Lawrence. Part of the reason why he’s able to have so many 1-on-1 match-ups is because the offensive line is busy trying to contain the physically powerful defensive line and the swarming linebackers. Here’s a sample of what the interior line will likely see (or feel) on Sunday. That’s NT Maliek Collins. He just tossed an offensive lineman to the side with one arm like he was Ron Swanson tossing vegan bacon in the garbage. He has a tendency to do that. He’s not even 300 pounds, and he’s shoved a down-block with one arm and then threw the pulling guard to the side and nearly grabbed the running back with one arm. On this play, Collins stood his ground and tossed two full-grown men to the side and wasn’t moved. He’ll be facing Jamon Brown on Sunday. The Cowboys run defense is holding teams to under 90 yards-per-game and opposing running backs are averaging 3.6 yards-per-carry. That isn’t all because of Lawrence, Collins, and the rest of the line. It’s also thanks to LB Sean Lee. Lee is a textbook sideline-to-sideline linebacker. However, there’s a possibility he doesn’t play Sunday. He didn’t practice Wednesday, Thursday, or Friday, thanks to a hamstring injury. Having Lee off the field would be a solid improvement for their running game. How do you stop the front-seven, and the defense in general? The simple answer is to pass the ball. The difficult answer is figuring out how to do it with a pass-rush this talented. But if the offensive line can give Goff time to get a good look down the field (again, easier said than done), the Rams will have success moving the ball. The run-defense for Dallas has been pretty solid. But during their best performance, a 40-yard cap against the Denver Broncos, the Cowboys passing game was practically helpless against the likes of QB Trevor Siemian. The pass-defense is allowing opposing quarterbacks to complete around 67 percent of their passes. Dallas defensive backs have been giving a lot of cushion off the ball, and Denver and Arizona took advantage of that. The Rams receivers have no problem running picks and screens, and that can continue against the Cowboys. Goff doesn’t need to torch the defense for 300+ yards. He just needs to see what the Cowboys are giving him. Fun fact: CB Nolan Carroll isn’t very good. He’s been one of the starting corners for the Cowboys this season and in man-coverage, he’s not good. Carroll is one of the lowest-ranked corners in the league. Whoever he’s covering, Goff should target that receiver. All day.